Imagine being at a spot where you feel completely hopeless. You were the 3rd born out of 10 children and were fortunate enough to make it to you second year of high school. You studied well and were excelling in all your classes, until one day, your family pulled you out of school because they did not have enough money to send you or your siblings. In fact, they didn't even have enough money to feed your family. Not to long after, you were lured into a relationship seeking comfort and hope, only to become pregnant out of wedlock. You gave birth to a beautiful baby boy, but had extremely limited means to take care of him. Then one unexpected day, you are told there will be an opportunity to allow people to train you in a skills specific program so that they can make a living. Every day for months you pray you will have the opportunity to be part of this program. And then imagine the feeling you would get when a friend introduces you to study tailoring courses at the Women Empowerment Program and you begin your first training class! This is a true story about Florence, a mom, friend, and now seamstress who is from the village of Nawabango, Uganda. She works hard every day to learn about sewing and to practice her skills. Her teacher, Miss Rovence, is confident she has improved so much, she is able to meet the demands of tailoring in her community and is about to graduate from her training. 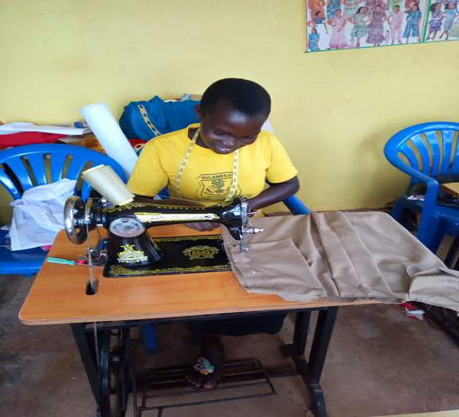 In fact, she has worked so hard, that since January, she and her teacher made over 100 uniforms for Empowered Leader’s Academy.